Can anyone relate to this scenario? 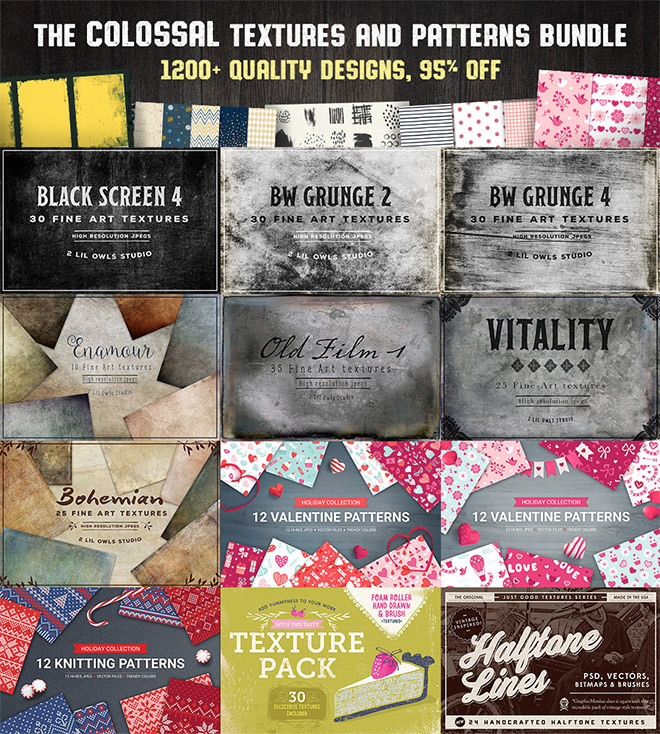 You’re working on a design and you need a high resolution texture to add some dirty effects to your artwork. You scour the web but you just can’t find what you need! 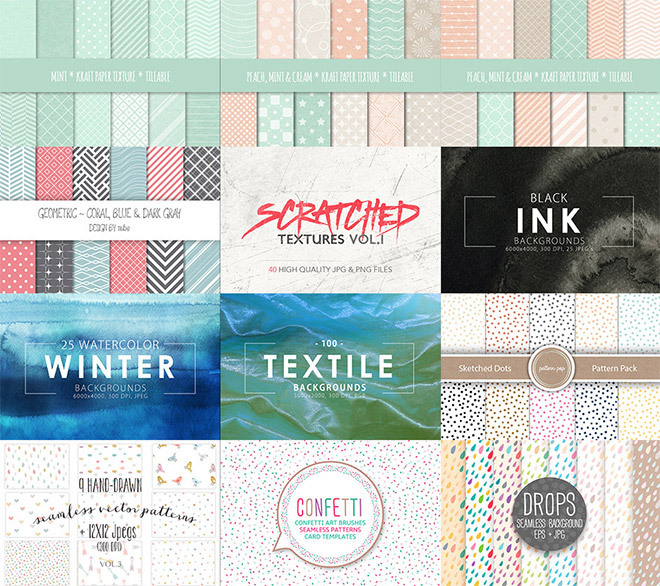 Avoid wasting time by arming yourself with this colossal collection of texture and pattern resources that you can choose from for years to come. This is an exclusive chance to own them for 95% off the regular price with unbeatable license terms. Do these similar products interest you instead? 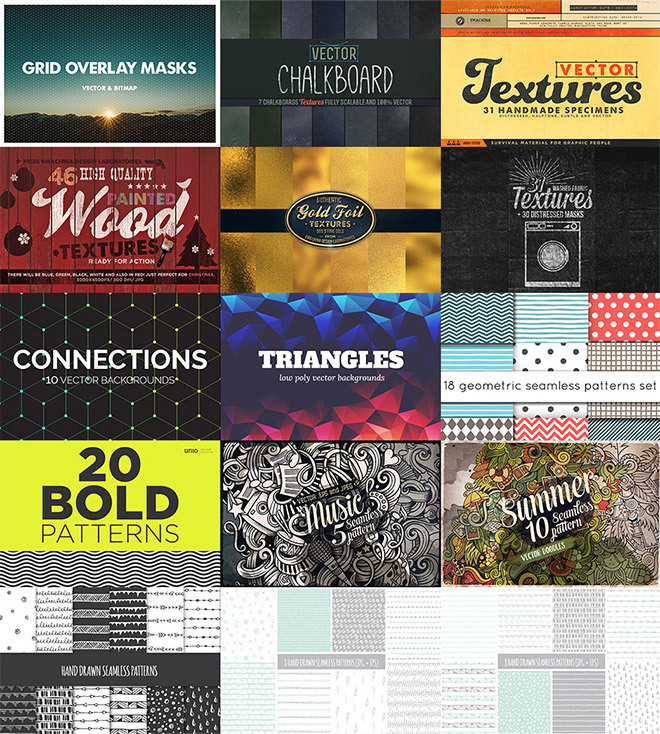 The Colossal Textures and Patterns Bundle is a comprehensive library of high quality design resources. 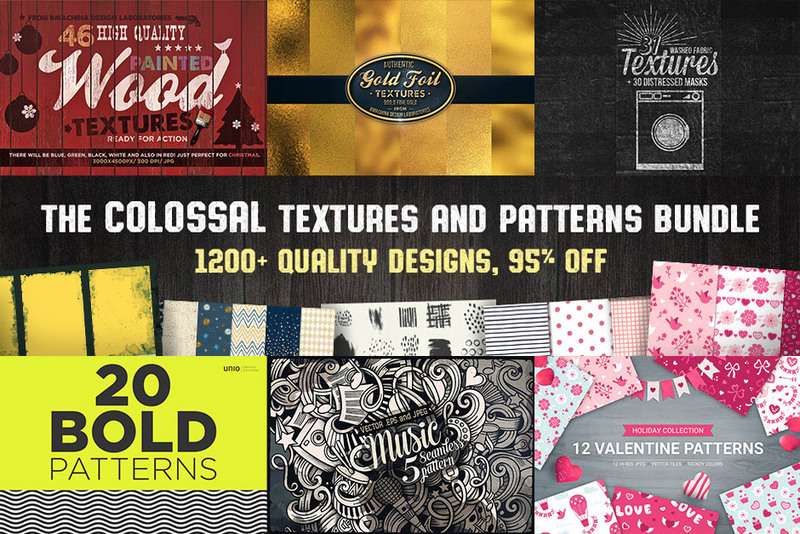 There’s every kind of texture you can ever need, including vintage papers, film, grunge surfaces, wood, card, halftones, ink, chalkboard, gold foil, fabric, scratched surfaces and more. This is alongside loads of additional pattern designs based on hand-drawn designs, geometric shapes, illustrations, and seasonal themes. If you’ve followed any of my tutorials, you’ll know how crucial textures are for achieving the vintage, weathered, grungy or distressed look. They’re effective when used as backgrounds to your designs, overlaid with the help of Photoshop blending modes, or applied as masks to erase away portions of your artwork with natural finishes. Equally, ready-made seamless patterns are extremely useful resources to have available. Making them from scratch takes a considerable amount of time, from illustrating the base graphics to tediously getting the design to smoothly repeat. A simple pattern can immediately transform a plain design by filling a large space, which makes them useful in packaging, stationery and print designs. 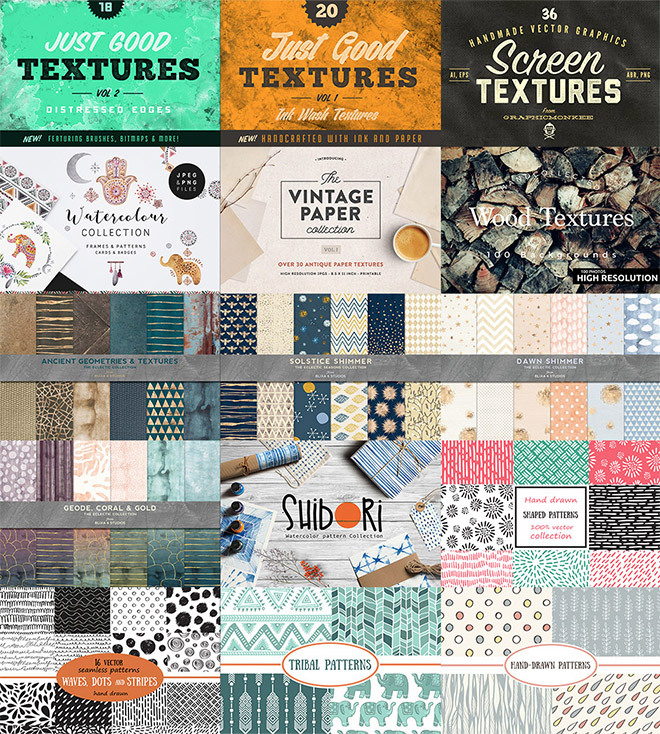 This new bundle contains over 1200 individual texture and pattern files across 54 premium design products. The total value is over $600 at their regular price, but this deal makes them available for a limited time at 95% off (just $29). Included in the price is the best extended licensing terms you can find, which covers you for commercial work and even prints and other items you intend to resell. With such a vast library of resources, the Design Cuts Browsing Guide is a huge asset worth mentioning. This file allows you to save even more time by being able to find the exact item you need with the table of contents and search functionality! Can I use this bundle in commercial projects? Different kind of collection of textures, one of my blog in initial stage and find out one text patterns, and one of texture is impressed of my blog is bold patterns. Thanks for sharing and getting more information from this post. I can’t believe my eyes when I saw the discounted rates. Moreover, the graphics are too good. hello, I was wondering to create a Photoshop element and i saw this post.